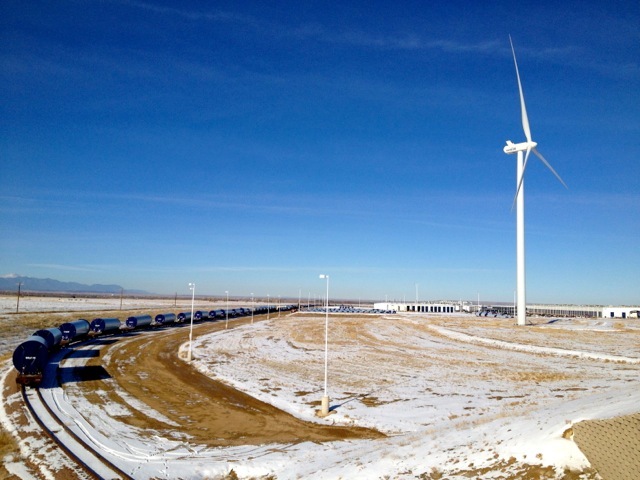 Just back from a tour of Vestas‘s plants in Colorado: towers in Pueblo, blades in Windsor, and nacelles in Brighton. Neat processes, and fun stuff. 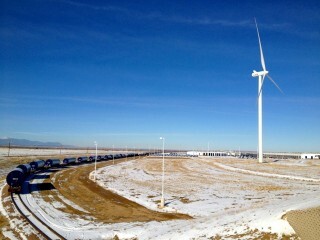 From what the linked news release said, it looks like the turbine has had a major mechanical component failure. 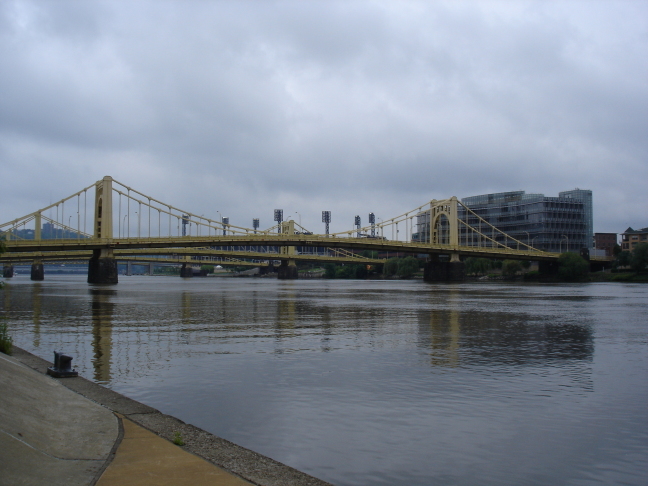 The replacement part will take several months to arrive, then needs a crane to replace it. 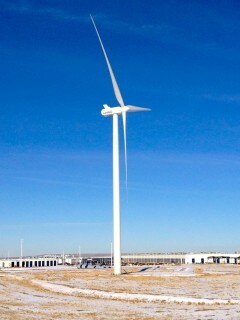 The turbine is structurally sound, and is even yawing to follow the wind, but can’t generate. This is a shame, as the volunteers at WindShare had just got the turbine operating at very close to commercial availability. There are also a couple of usefully windy months before the summer for which co-op members will lose revenue. 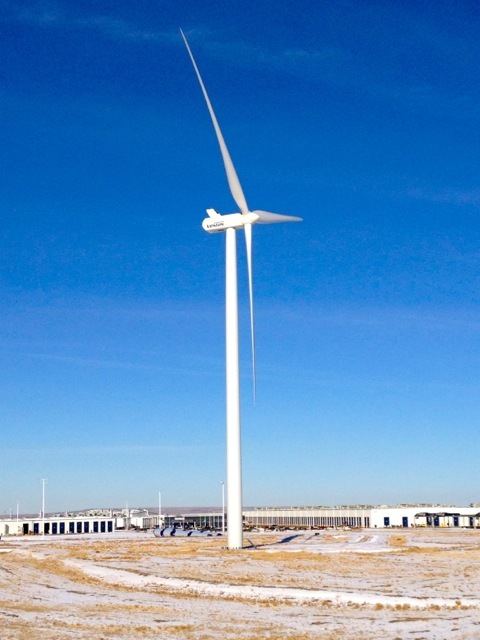 Update: a very watered-down news release went up on April 3rd: Turbine Technology Update. Ever since I discovered them, I have been fascinated by the Foxfire books. Not that I’m planning to go back to the land or anything, just they they often display flashes of ingenuity and craftsmanship. 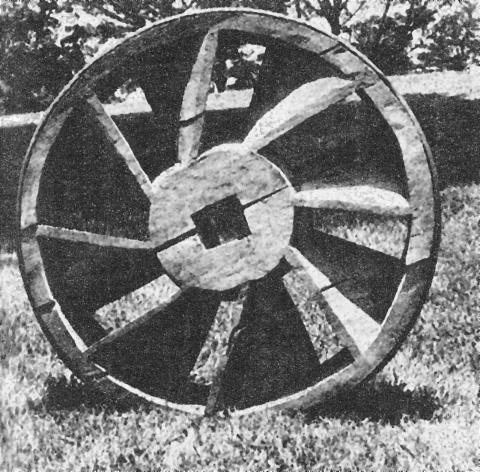 It’s clearly a turbine runner, but it’s made from a slab of solid pine, pinned together then held in compression by steel bands around the rim. 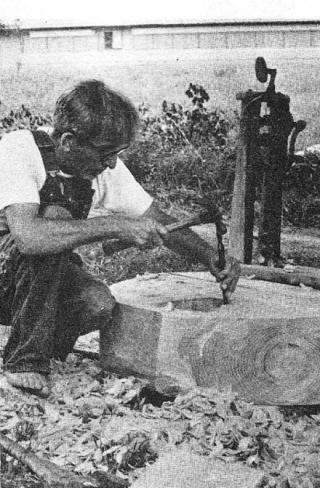 It was made by Georgia craftsman Sam Burton, and is documented in Foxfire 2 (Wigginton et al, 1973, pub. Anchor Books, ISBN 0-385-02267-0, pp. 142-163). I took this a while back (June 2004), but forgot about it. 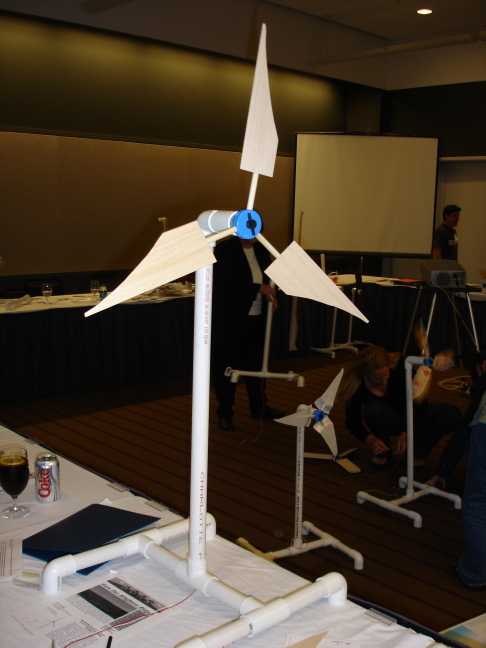 Windmills is a very simple Flash game involving wind turbines. The page URL sometimes inexplicably switches to d3095932.ejt86.ejtechinternational.com from awe-wind.com. The product page for the AWE 52-750 shows a bunch of non-operational turbines. 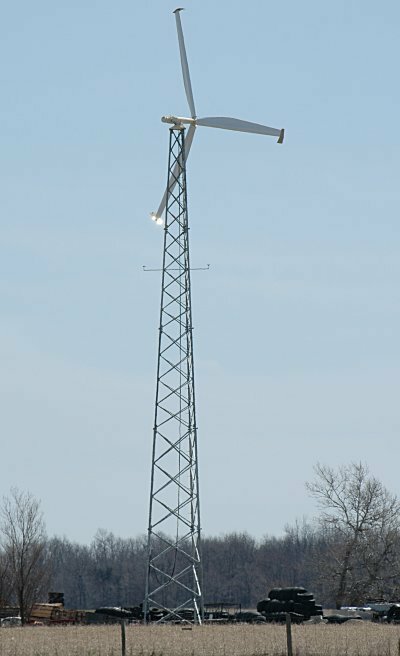 The AWE 52-900 page also has a picture of a parked turbine, and it looks a lot like Tallon Energy’s 52-750 at Pincher Creek. More parked turbines on the 54-900 page, and occasionally a completely different machine is shown. Oh wait, I get it – it’s a random turbine image for each page. Hmm. too many wind turbines in the UK? Hardly! Flying back from Denmark over the UK the other day, I hoped to see at least some wind farms. In a highly unscientific study, I peered out the window from approximately Nottingham to Iona. 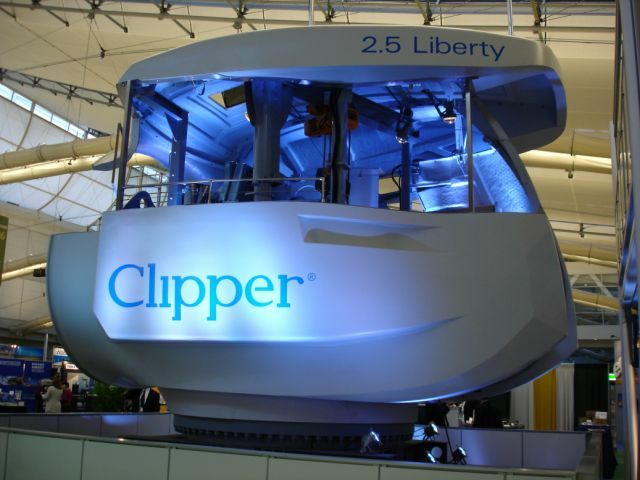 You know how many wind turbines I saw? Four. You know how many were working? One. Hardly something that’s taking over the landscape. And strangely, the one I saw working, at Chelker Reservoir, I used to drive past quite often on my way to Skipton. I’ve never seen more than a couple of those old WEG 300kW two-bladers running. I was frankly amazed there were any of them left. Even from 10000m, you could make out the herky-jerky rotation. Author scrussPosted on 02006-05-25 02006-05-28 Categories Wind ThingsTags 1000, ack, denmark, drive, eft, flying, old, red, study, turbine, UK, urbine, wind, zedLeave a comment on too many wind turbines in the UK? Hardly! Morning in rainy Herning. Not much to say except we’re zooming off to see the wind turbine nacelle factory in Brande this morning. It’s nice here at the Risø test centre, with a view of over 70 wind turbines across Jutland. I’m on top of a Siemens 2.3 MW turbine. There’s an elevator, before you ask how I got up an 80m tower. Blue skies, crops growing, grasshoppers hopping, wind turbines turbing, blue-winged swallows over my head. In short, it’s a beautiful day in Kingsbridge. Blue skies, crops growing, grasshoppers hopping, wind turbines turbing, blue-winged swallows over my head. In short, it’s a beautiful day in Kingsbridge. The WindShare turbine is running again – yay! 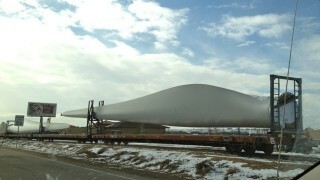 I think it’s an AOC 15/50; note the downwind design and prominent blade tips. It’s near Mornington, which is SE of Listowel on Hwy 86. Catherine and I spent the weekend in Goderich, and we came home the scenic route through Wingham and St Jacobs. I hear that the WindShare turbine is not well, and there is no diagnosis yet. Tallking to the OPA today, it seems that WindShare doesn’t qualify for SOC because it’s behind ExPlace’s meter. Aargh! Update: I got a call from the OPA; they were wrong. 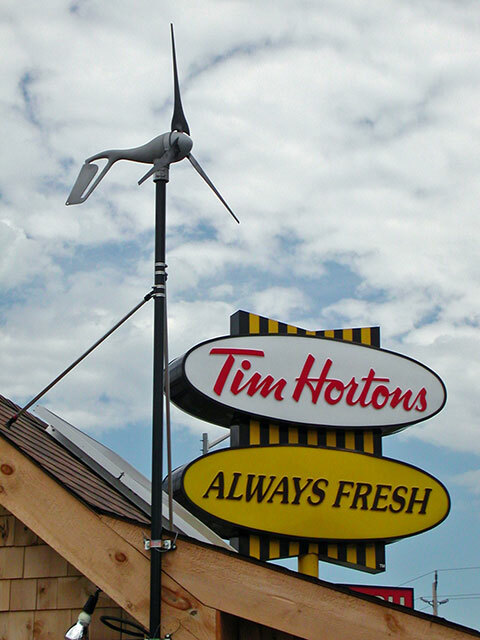 Grandfathered embedded generation such as the WindShare turbine will be eligible after all.